$6.53 /SF (Versailles Pattern - 160 SF Pallet) Contact us for pricing and quantity discounts. Local pickup and direct shipping anywhere in the USA. 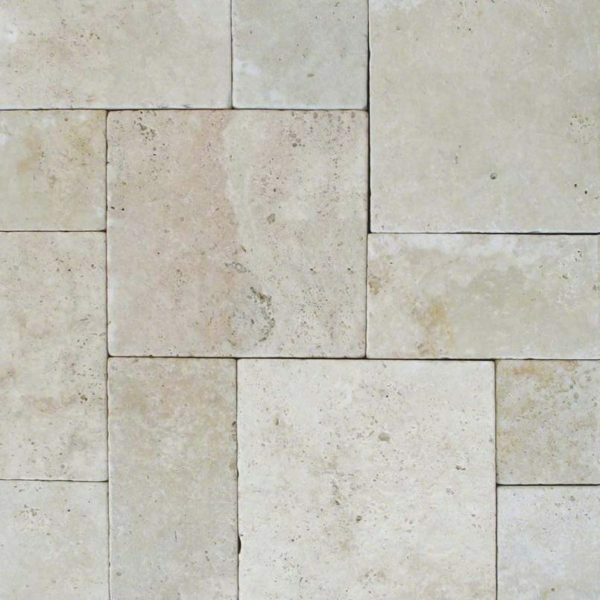 Tuscany Beige Tumbled Travertine pavers embody style and class. Their warm cream and tan hues add rustic sophistication to any landscape/hardscape design. This versatile travertine is available in a range of sizes from 8×8 to 24×24 for ultimate flexibility in design. It is available as a 1.25 inch thick paver and as 2 inch thick pool coping. Tuscany Beige Travertine pavers are perfect for use around pools, on patios, walkways, and outdoor living spaces.